The Willis Retreat - Fairplay Cabin on 8 Secluded Acres, Hot Tub, Pet Friendly! 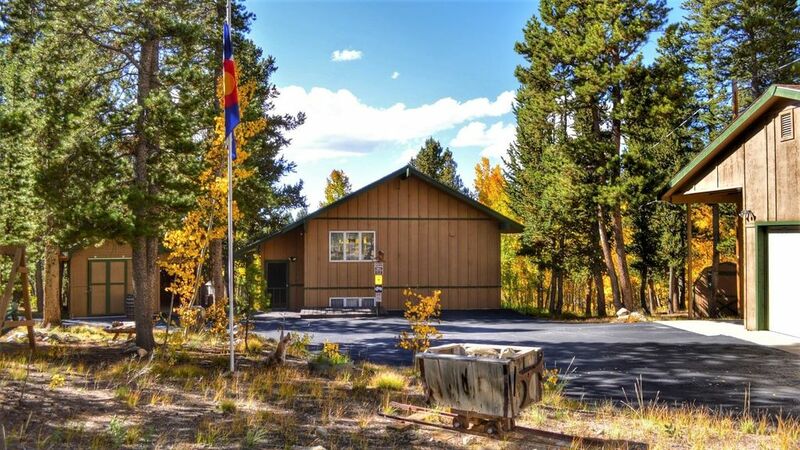 The Willis Retreat sets the standard in the South Park area for comfort, seclusion, complete amenities, easy access, and all the beauty of the Colorado Rockies at an affordable price. Location, location, location! The Willis Retreat is located just 2 miles north of Fairplay, so if you need to head into town for groceries or gas its about a 5 minute drive. Breckenridge is 19 miles to the North (about a 30 minute drive), and its just 65 miles to Denver. The Retreat sits on 8 acres of pine and aspen to give you plenty of privacy, and its only one mile off Highway 9. The road leading to the cabin is maintained and plowed by the County so its easily accessible even when the snow falls. And because the Retreat is located North of Fairplay you'll find access to Breckenridge and Summit County to be quick and very convenient. About the Retreat: There's plenty of room at the Retreat with its 2,500 square feet, four bedrooms, two bathrooms, giant two-car garage and carport, a paved driveway and two large storage sheds. The interior features a well-appointed kitchen attached to the huge Great Room that includes a 46" HDTV with DirecTV service, DVD player, and stereo system. A large deck sits off the Great Room for relaxing under the stars and viewing the wildlife that passes through the property. The lower deck features a 7-foot Cal Spa hot tub with LED multi-color lighting display, cascading waterfall, contoured seating with pillow headrests, and 35 jets to help you unwind and rejuvenate at the end of a long day. It's protected from the elements and offers nice views of the backyard and our little meadow plus plenty of privacy. There are also outdoor speakers connected to a stereo and satellite dish so you can listen to commercial-free digital music. You'll find a beautiful King-size log bed in the master bedroom and a queen log bed in the second bedroom. The kid's room includes bunk beds while the 'Game room' bedroom has a twin futon sleeper. There is also a queen-sized sofa sleeper in the Great Room. There are HDTV's in the Master bedroom and the Gameroom bedroom, both with DirecTV service. The Gameroom has a Sony PlayStation 3 plus a selection of video games and DVD movies ranging from kids to adults. The Kid's bedroom also has an HDTV for watching DVD movies. Need to stay connected while you're on vacation? Feel free to bring your tablets/laptops and tap into our Wildblue Exede satellite internet wi-fi network to check your emails, surf the Net, etc. Cell phone signals are also good at the Retreat. The cabin is pet-friendly and has a large dog run in the backyard when you want to keep your dog secured outside. If you would like a little more room to walk your dog than our 8 acres offer, Pike National Forest is just two miles down the road. So the next time you're in the area and you want privacy, accessibility, comfort and all the beauty of the mountains at a reasonable price, make your plans to stay at the Willis Retreat. Thank you and we look forward to having you as guests! We are life-long Colorado residents, we love spending time in the mountains with our 2 kids and 2 dogs, and we are truly blessed to be able to share this wonderful property with others. We chose this area for a number of reasons. First, its a quick 90 minute drive from where we live in Denver, and you don't have to deal with the traffic gridlock on I-70! Second, its much less crowded than a lot of the tourist areas in the Mountains yet all the necessities are within 5 minutes of the cabin. We didn't want a property in a busy resort community but we did want to be near one. This area fit the bill because its just 20 miles to Breckenridge. And finally, its an absolutely gorgeous area throughout the year. My favorite thing about the Willis Retreat is its location. While its only 5 minutes from town it is absolutely peaceful and secluded. There are other cabins in our area but you cannot see them so the privacy is wonderful. The upstairs patio is huge and is a great place to enjoy a beverage while overlooking a pretty meadow with South Park and the Mosquito Range in the background. Our kids love the treehouse in the backyard and the sledding hills in the Winter. Within just a few minutes of the cabin there are great hiking and 4-wheel drive trails, and if you like fishing there are tons of streams and lakes full of trout. Finally, at the end of a long day there's nothing like relaxing and unwinding in the hot tub. To me, this is the Rocky Mountains at its best. The South Park Recreation Center is 5 minutes from the cabin with full workout facilities, indoor swimming pool, and other amenities.